Corporate Watch and Stop Deportation have released a new briefing on deportations, focusing on the Home Office’s use of charter flights. The 48-page briefing, entitled Collective Expulsion: The Case Aginst Britain’s Mass Deportation Charter Flights can be downloaded here, or you can buy a hard copy from the Corporate Watch online shop. You can read a review of our report on the Pluto Press blog here, as well as a photo-essay of a recent mass deportation charter flight for more information on the topic. This report examines the British state’s most secretive and draconian immigration controls: mass deportation charter flights. The policy has existed in the shadows for over a decade, evading popular criticism and any meaningful review. Away from the public gaze, using specially chartered aircraft, the immigration authorities try to get rid of as many unwanted migrants as possible. Indeed, these mass deportation charter flights are becoming the standard method of conducting enforced deportations to a growing list of destination countries. There is now at least one flight a week to ‘popular destinations’, such as Afghanistan, Pakistan and Nigeria, which are often closely linked to the UK’s most controversial foreign policy adventures. Yet, the programme was, and is still being, sold to the public on the basis of unfounded myths and outright lies, which have gone unchallenged for far too long. The UK Home Office has used specially chartered flights to deport rejected refugees and migrants en masse for 12 years now. The policy was introduced in 2001 ostensibly to save ‘taxpayers money’ and effect high ‘volume removals’ of people who refuse to ‘cooperate’ with the immigration authorities. Officials have also claimed the programme was designed to send a clear message, both to the British public and to migrant communities, that the UK is serious about enforcing its ‘tough’ immigration policy. This report examines in detail each of these and other deceptions underpinning the programme and debunks them using previously unpublished data covering the first 10 years of the programme. The sources used range from Freedom of Information requests, statistical analysis of official figures, court cases, government reports and media articles, in addition to case studies based on testimonies from migrants deported on these flights or organisations that worked with them. Having debunked the myths, the authors then attempt to unravel the ‘ulterior motives’ behind the UK’s deportation charter flights, bringing to light little-known statements by government officials, secretive meetings and dodgy political deals. The motives examined range from a targets culture introduced by Labour and maintained by the current, Conservative-led coalition government, to the political agendas revolving around the UK’s foreign policy and its disciplining of migrant diaspora communities. The next section explores a number of important legal questions concerning mass deportation flights, delving into the murky depths of European and UK case law, international treaties and other legal instruments. Among other things, the authors argue that deportation charter flights constitute a de facto policy of ‘collective expulsion’ and must, therefore, be prohibited. Even without this argument, a number of procedural issues that can be used to challenge the legality of these flights are also explored in detail. This is followed by two short sections on specific issues with significant legal implications: overbooking and the use of ‘reserves’, and the more recent use of monitors and doctors on mass deportation flights. It is important to remember that, unlike deportations on scheduled flights, there are often no commercial and procedural barriers to the exceptional, brutal policies and practices surrounding mass deportation charter flights. There are also no other passengers to witness what happens on these flights, as some passengers did in the famous case of Jimmy Mubenga, leading to shocking revelations about the use of fatal restraint techniques and racist language. On charter flights, immigration officers and private security guards can get away with virtually anything, as they often do, in order to enforce the government’s ‘tough’ immigration policy. Hence, this report not only calls for the immediate halt of the deportation charters programme on the basis of detailed factual findings and legal arguments, but also challenges different practices and procedures that have been institutionalised or taken for granted during the 12 years of this little-known-about programme. A note on the language: throughout the report, the authors use the words ‘removal’ and ‘deportation’ interchangeably, even though the two terms have different meanings in law and official jargon. ‘Administrative removal’ is a power enjoyed by normal Home Office immigration case workers who can decide, as they often do, to remove someone from the country after their immigration or asylum claim has been refused. Deportation, on the other hand, is used for foreign national offenders who have been sentenced to a criminal sentence of 12 months or more and are then deported – whether with or without a court order – as a second punishment because they are ‘not conducive to the public good’. The interchangeable use of the two terms, or using ‘deportation’ for both, is a conscious choice: the authors of the report believe deportation should not be an administrative power or an additional punishment (the latter issue is explored in depth in the section on foreign national prisoners). The same goes for the interchangeable use of immigration prisons, (administrative) detention centres and immigration removal centres (IRCs), as they are officially called now. In a similar vein, the terms ‘migrants’ or ‘migrants and refugees’ are often used by the authors for all types of migrants, unless a legal distinction is necessitated by a specific context. Derogatory, stigmatising and often inaccurate terms, such as ‘failed asylum seekers’, ‘illegal immigrants’ and so on, are used by politicians and the media to divide migrants into ‘good’ and ‘bad’ ones, legitimate and illegitimate, then demonise and illegalise those who do not not fit one of these artificially constructed, politically motivated categories. The authors believe that people choose or are forced to migrate for a wide variety of reasons and should be able to travel and live wherever they want or need to. Whilst writing this report, the UK Border Agency (UKBA) was split into two separate operational units: Visas & Immigration and Immigration Enforcement. It is the latter that is responsible for most of the policies and practices covered in this report (detention, deportation, etc.). The head of the unit is David Wood, who also features in the report as the previous head of Criminality and Detention within the UKBA. Thanks are due to Frances Webber, Juliane Heider, Bethan Bowett-Jones, Amanda Sebestyen, Sita Balani and everyone else who helped us with this report, whether by providing information or financial support, reading or commenting. Thanks are also due to the detainees and deportees who shared their tragic experiences with us. It is to them, and all the other migrants and refugees who have faced and will face similar fates, that we dedicate this report. 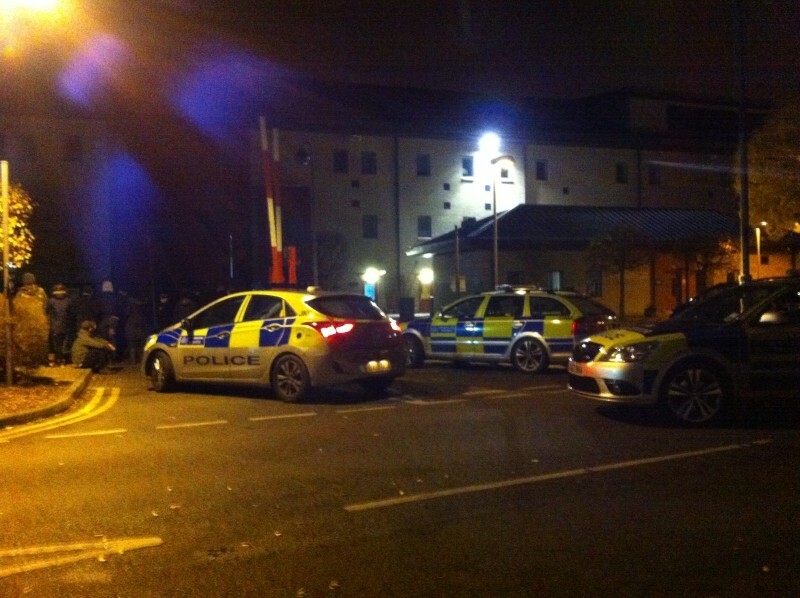 Police arrived outside Harmondsworth Immigration Removal Centre at 4am. One man was arrested at 7am. Supporters of Nigerian hunger-striker Isa Muazu are blocking access to Harmondsworth detention centre (outside Heathrow) to stop his deportation scheduled for 8 am. A man super-glued his hand to the detention centre main gate at 4am, flanked by a crowd of 15 steely campaigners. A specialist police unit took several hours to remove the glue. The man was arrested at 7am. Detention centre guards initially used dogs and pressure points but failed to ward off the early bird demonstration. Supporters feared the Home Office was about to move Muazu to the airport at the crack of dawn. A private jet is reported to be on standby, but critics say he is too weak to survive the flight, having refused food for nearly 100 days. Muazu’s case is a cause célèbre, with eminent actors and artists delivering a letter to Home Secretary Theresa May yesterday demanding she show clemency on his case. Campaigners in Glasgow protested outside the Air Charter Scotland HQ yesterday, calling on the company not to operate Muazu’s deportation flight. Isa Muazu’s injunction was refused around midnight. His solicitor is understood to be launching an appeal. A spokesperson for the group, Jane Simmonds, 24, from Clapham, commented “Why has it even got this far? The Home Office should never have considered deporting Isa given his medical condition. The legal process has been hijacked by Theresa May’s hard-line politics. 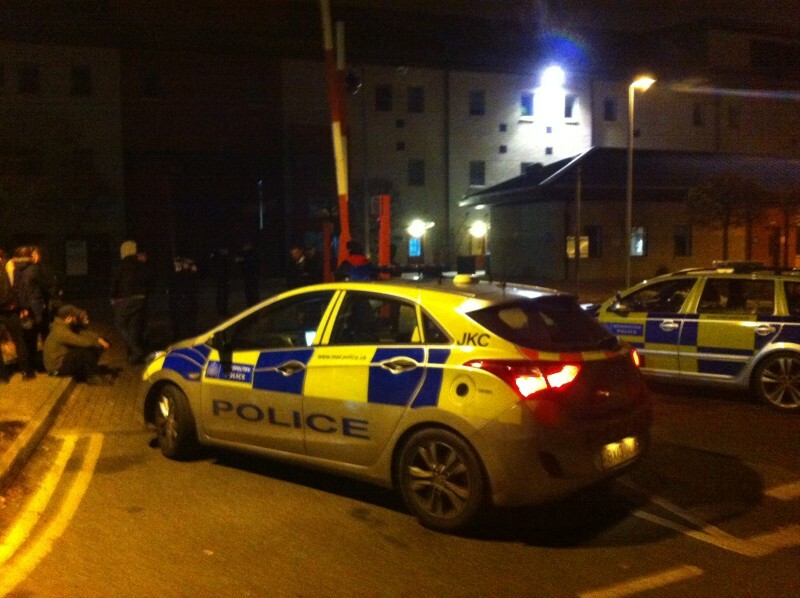 Campaigners were left with no option apart from physically blocking the deportation in the early hours of this morning”. Over 60 vulnerable people face deportation to Nigeria at 8.30 TONIGHT on a specially ‘chartered flight’ [number PVT 090] organised by the Home Office and departing from an undisclosed UK airport. The situation is made more difficult by the UK Border Agency who are moving detainees between different immigration detention centres in preparation for tonight’s flight. Unity say that an LGBT asylum-seeker “was moved on the day of his surgery with a lawyer which greatly delayed his access to legal help”. Unity are calling for anyone who can to call the Nigerian High Commission and urge them to try to stop the current charter flight. Anyone who has time please call the number below and let them know of your concern for many of the individuals on this flight and urge them that they do not have to be party to this inhumane method of mass deportation but that the merits of each immigration case should be considered fully and not rushed in order to fill mass charter flights which is what is occurring. extention 277, alternatively just press 0 during the main menu of options. The UK Border Agency has contracted a controversial security company to provide emergency medical staff on mass deportation flights, Phil Miller reveals in an exclusive investigation published by Corporate Watch today. Armatus Medical Services, part of Armatus Risks Ltd, won the three to five-year contract in May 2011. Armatus Risks’ directors include an ex-bodyguard to notorious US General Patreaus, and four of the five directors listed on the company’s website boast experience as private military contractors. According to media reports, eleventh-hour suicide attempts by refused Tamil asylum seekers were commonplace. The HMIP report cites one case where a detainee “had previously self-harmed, apparently to stop his removal, and had handcuffs on for 5.5 hours from Brook House [detention centre] to the Airport [Stansted].” “It was difficult to understand why the detainee needed to be restrained for so long given that he was under constant staff supervision,” it added. The man was “examined by medics after the handcuffs had been removed, and the paperwork was completed appropriately.” The report confirms that healthcare staff on the flight were employed by Armatus. “They accompanied each coach and three were on the flight itself – one paramedic and two ambulance technicians.” According to Armatus, all its medics are recruited from the UK ambulance services and from personnel who have completed a training course known as ‘Armatus Risks community responder medical (FPOS-I)’. The same inspection report criticised the private security guards for having “no accredited training on use of force in the confined space of an aircraft.” It has been two years since HMIP first noted that no such training existed. The guards are currently supplied by security company Tascor (formerly Reliance), which took over the role of providing deportation escorts from G4S in May 2011, following the death of Jimmy Mubenga on board a BA flight during his forcible deportation to Angola in October 2010. Reliance was bought up by Capita in August 2012 and renamed Tascor. In July 2011, the UKBA announced that a company called Taylormade Secure Solutions was now the approved supplier of paramedics for escorted deportation operations. Taylormade was at the time a subsidiary of Armatus Risks Ltd, which was formerly known as Longmoor Risks Ltd. The latter took its name from a Royal Military Police base at Longmoor in Hampshire, where most of the company’s directors had taught before selling their military expertise to the highest bidder (see here and here, for example). Moreover, Wheeler was a director of Reliance between 1997 and 2000. Wheeler’s ‘extensive contacts within the security field’ may not have only contributed to Armatus getting this contract, they also mean medical care to already vulnerable people is now provided by security companies, where a different set of values and institutional culture dominate. The managing director of Armatus Medical Services, Charlie Taylor, served in the British Army’s drone regiment and was “deployed to Iraq in early 2003 in an intelligence-gathering role,” according to his profile on the company’s website. Another division of Armatus provides staff for anti-piracy operations and was promoting its work at a security industry summit in Sri Lanka last year. Sri Lanka is fast becoming a hub for private maritime security companies in the Indian Ocean. Most of Britain’s recent arms exports to the island have gone to anti-piracy outfits. Prison guards at Yarl’s Wood have given detainees gift bags to celebrate today’s 52nd anniversary of Nigeria’s independence from Britain. Tomorrow, dozens will face mass deportation to Lagos in UKBA’s ‘Operation Majestic’. Nigerian women detained at the Yarl’s Wood Immigration Removal Centre (IRC) in Bedford report that Serco, the private contractors, presented them with gift bags in celebration of Nigerian Independence Day. With cruel irony, Serco are participating in a mass deportation of Nigerian detainees from Yarl’s Wood to Lagos tomorrow (Tuesday 2nd October). Serco’s twisted gesture comes after a month of resistance inside the detention centre. Detainees had attempted a co-ordinated hunger strike to demand “an end to the racist and abusive system of detaining people who have committed no crime other than seek a life free from torture, persecution, abuse and poverty”. Serco allegedly responded by breaking up meetings and intimidating leaders. Mass deportations from London to Lagos occur every 6 weeks. The UKBA use specially chartered flights with 2 security guards for every deportee, a process which is code-named ‘Operation Majestic’. In 2011, there were 11 flights expelling 492 Nigerian migrants. The Nigerian government is complicit in the degrading treatment of their citizens abroad. The UKBA pay staff from the Nigerian High Commission £65 each time they question detainees about their nationality and issue emergency traveling documents as required for a deportation. In a Freedom of Information request conducted by the author, the Home Office refused to disclose further details about this scheme, claiming it is not in the public interest because “providing details of the requested information would be likely to discourage the High Commission from co-operating with UKBA in the future”. 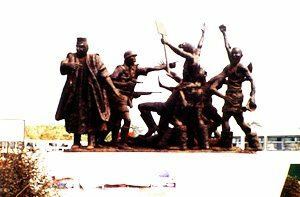 After 52 years of so-called independence from British rule, ‘Operation Majestic’ is just one example of the neo-colonial relationship between London and Lagos. Shell, the Anglo-Dutch oil company, was granted exploration concessions in the Niger Delta by colonial administrators in 1937 and never left. The energy giant has profited handsomely from oil exports totaling more than $600 billion since 1960. However, the majority of the population live on less than $2 a day. Inhabitants of the Niger Delta have long accused Shell of polluting their environment and not sharing the oil revenue. British companies and state officials have systematically suppressed local demands for a more equitable share of Nigeria’s natural resources. Flag sovereignty was tolerated, resource nationalism was not. In 1967 Biafrans declared the eastern part of Nigeria to be an Independent State. Whitehall secretly armed the federal military government to crush Biafran self-determination. According to Mark Curtis, “the priorities for London were maintaining the unity of Nigeria for geo-political interests and protecting British oil interests”. The 3 year conflict claimed an estimated 3 million lives. The failure of non-violent resistance marked a dawn of armed struggle in the Niger Delta. The Nigerian authorities have responded by militarising the region in a bid to wipe out militants. Under New Labour, Britian supplied £150m worth of arms to the Nigerian government and began the mass deportation of Nigerian migrants. Critics have compared the deportation charter flights to slave ships, in reference to the Atlantic Triangle between West Africa, the Caribbean and Europe. It is true that Britain continues to send arms and investment to Nigeria, while Bonny Light Crude flows from the Delta to North America like the Palm Oil that preceded it. And so many people born among this tremendous mineral wealth are shackled, exploited and herded around the globe by the white man like their ancestors were before them. Why she was even issued with removal directions by UKBA in the first place remains an unanswered question…. 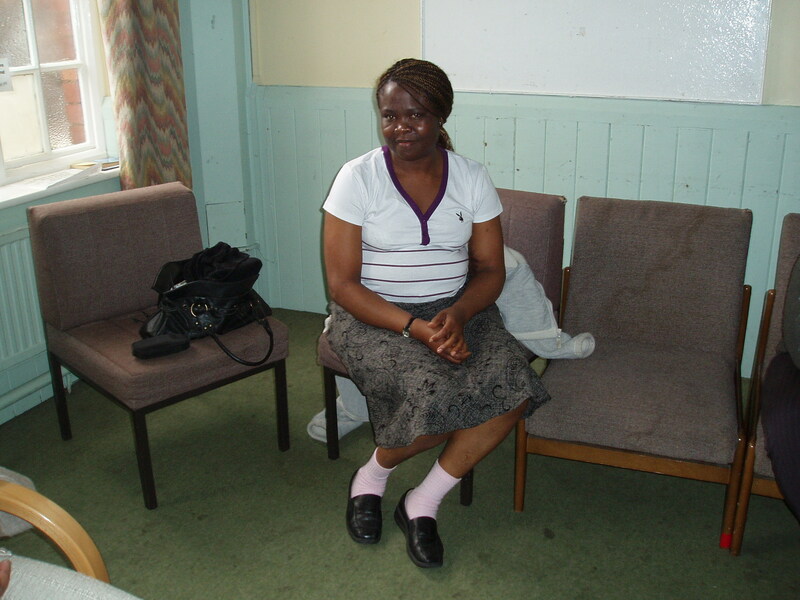 On Saturday 26 May 2012 Roseline Akhalu (“Rose”), 48, a kidney transplant patient currently detained in Yarl’s Wood detention centre was served with removal directions for Lagos, Nigeria on 7 June 2012. Rose, a Nigerian university graduate, came to the UK in 2004 on a Ford Foundation scholarship to do a Masters degree in development studies at Leeds University. Soon after arriving she was diagnosed with renal failure and began treatment the following year. In 2009 she had a successful kidney transplant. As a kidney transplant patient Rose needs to take immunosuppressant drugs for the rest of her life. However, the cost of such drugs in Nigeria means that there is no way Rose will be able to afford them and so, if deported, she faces certain death. Rose is a respected and popular member of her community and many have appealed to the Home Secretary to show compassion but all such appeals have fallen on deaf ears. Public Interest Lawyers (“PIL”) are now instructed to challenge Rose’s removal and to bring a civil claim for damages for the ill treatment she has suffered at the hands of UKBA and their contractors Reliance. When Rose was first detained in March 2012 she was prevented from using a toilet and forced to urinate in a plastic bag in the back of a van before being left to sit in her urine sodden clothes for the rest of the journey to Yarl’s Wood. As a result of this unlawful treatment Rose suffered a serious urinary tract infection. Since being re-detained on 16 May 2012 Rose has become extremely unwell because she has been denied access to adequate medical care. On Friday PIL made representations to the Home Secretary demanding Rose’s immediate release. If Rose is not released we will seek an emergency injunction preventing her deportation. For more information please contact Tessa Gregory on 0121 515 5069 or tessa.gregory@publicinterestlawyers.co.uk.